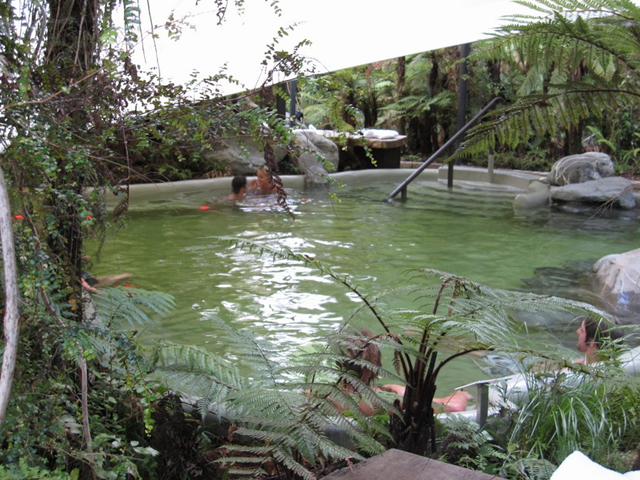 One of the private hot pools at Glacier Hot Pools in Franz Josef. People flock to the little town of Franz Josef because of its proximity to the glacier by the same name. So, like everyone else, we’d spent our morning and the early afternoon hiking out to the face of the glacier and on some of the paths around it. It was beautiful, and very much worth the effort, but also pretty tiring. Not so much because the trails we’d hiked were difficult – because they really weren’t – but more so because Wendy had been carrying our daughter, who, at the time, weighed about 20lbs/9kgs. 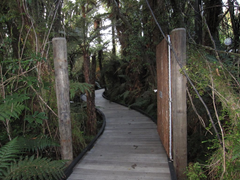 The path to our private pool at Glacier Hot Pools, Franz Josef. Luckily, small as it is, Franz Josef has the answer to your weary legs and aching back. 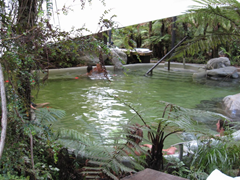 The Glacier Hot Pools offer three different temperatures of pools. They range from cool enough for a baby to hot enough to cook your dinner. 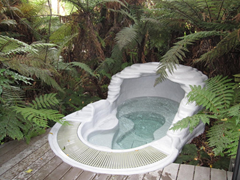 Along with the regular pools, they also offer three private hot tubs. These come with their own changing room/bathrooms and entry to the regular pools is also included. (According to the staff, the glacier water for the private pools is re-filtered after every use.) We decided to spring for a 45 minute session in a private pool and then check out the regular ones. 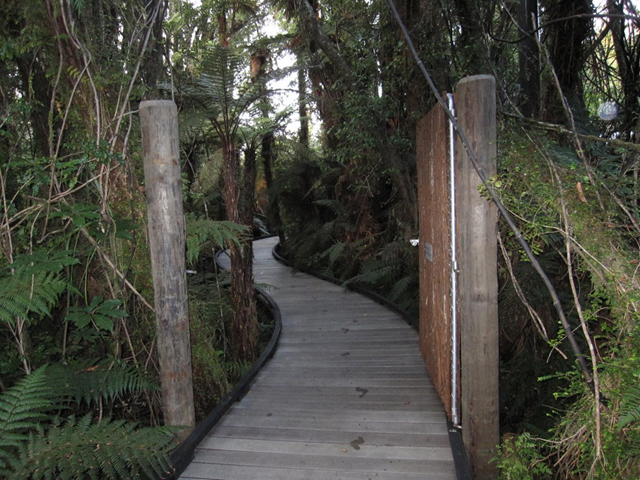 We were led to our private pools down a path through a wooded area. It instantly felt very private and very calming. There was a privacy fence with a gate, and the whole pool was surrounded by trees and ferns. 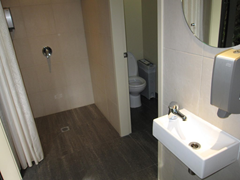 The changing room/bathroom was impeccably clean and very convenient. There was a decent sized deck in front of the pool which was large enough so that our daughter could hang out in her stroller. (Poor kid!) It was definitely very relaxing and enjoyable. After our blissful 45 minutes were up, we headed to the main pool area. The public pools are also surrounded by wooded areas and the setting feels very natural and calming. They’re shaded with large tarpaulins which were perfect to shade us from the sun, and would also work well in the rain. The coolest pool was 36C/96.8F – which is cool enough to be safe for babies and young children as well as pregnant women. This made it a great family activity for us and our daughter (who was 10-months-old at the time) had a blast splashing around. The hottest pool was 40C/104F which was too hot for Wendy. We’re pretty sure that the middle pool split the different at 38C/100.4F. It was hot without being overly so. There were plenty of other people there on the day we went, but it never felt overly crowded. The pools are quite large and there was more than enough personal space – including room so that our daughter didn’t wind up splashing other people! 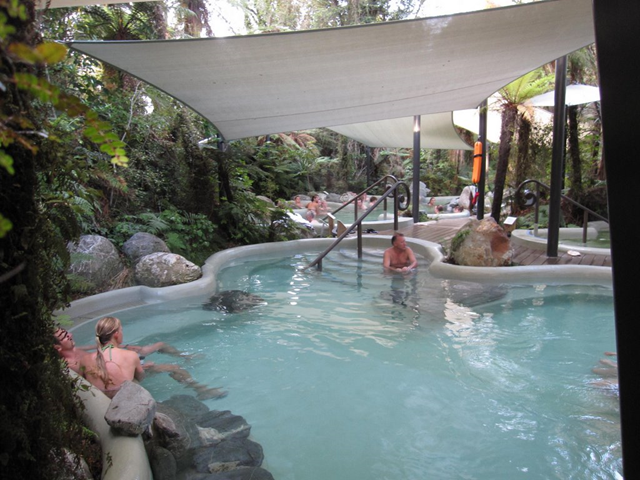 The main public pools at Glacier Hot Pools, Franz Josef, are nestled into a wooded area and shaded with large tarpaulins. There is no time limit on your use of the regular pools. We definitely lingered for a while. The setting is very relaxing and was the perfect complement to all the hiking we’d done that morning! When we were finally done, it was very nice to find that they have two family change rooms, making it very easy for a family with young children to get dressed after their dip. Our only (minor) complaint was that they change room was FREEZING. Our very easy-going daughter was decidedly unhappy and we were shaking cold by the time we all got dried off and back into our clothes. It was really weird, because it really wasn’t a cold day. Other than that, the change room was very clean and extremely convenient. The natural setting helps to make a trip to Glacier Hot Pools very relaxing and enjoyable. We would absolutely recommend a trip to the Glacier Hot Pools. It was really a great, relaxing end to a wonderful day in a beautiful area. The time in the private pool is definitely romantic (even more so if you don’t bring a “chaperone” in her stroller 😉 ) and relaxing. We felt it was worth the splurge. (Especially as it happened to be Wendy’s birthday). The public pools are also very calming and set in such a tranquil setting you’re sure to find yourself very relaxed after your soak!